We 21st century humans are busy creatures. Bombarded by a constant stream of data flowing into our smartphones, we struggle to respond to text messages, tweets and e-mails in a timely fashion. 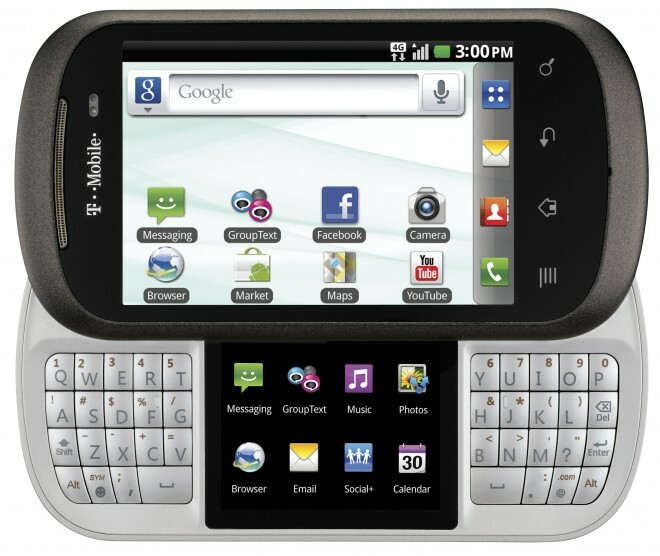 But LG’s latest smartphone, exclusive to T-Mobile, may provide a solution. Dubbed the DoublePlay, the handset boasts a 3.5-inch touchscreen display for viewing content, and a slide-out qwerty keyboard that should appeal to the dwindling numbers of BlackBerry faithfuls among us. And, in a strange twist of industrial design, the DoublePlay also comes with another 2-inch touchscreen that splits the keyboard in twain, and serves as a second app dock for fast task-switching. At first glance, the second screen seems like sheer novelty. T-Mobile pitches the dubious idea that the additional screen is perfect for the world of “fast-paced social networking.” I can’t say I’ve ever been struck with such an urgency to tweet that I’ve required a second screen to do so, but perhaps my wit isn’t as sharp as yours. Nonetheless, the DoublePlay allows instant access to up to eight apps docked on the second screen, eliminating the need to mash the home button over and over to access your app menu. It’s a nifty time-saver for those obsessed with multitasking, and even the non-obsessive tweeters and texters among us should find the second screen helpful. Android device manufacturers are scrambling to differentiate themselves from one another in today’s extremely crowded mobile market. Some companies are attempting to carve out identity by adding more screen real estate, and, to this extent, the DoublePlay is akin to Kyocera’s take on an Android handset from earlier this year, as well as Sony’s unreleased clamshell tablet, the S2. In addition to the 2-inch touchscreen, the DoublePlay boasts a 1GHz Qualcomm Snapdragon processor running Gingerbread, the latest version of Android (hopefully it will be upgradable to the forthcoming Ice Cream Sandwich OS release). The phone also sports what looks on paper to be a decent camera: 5 megapixels with support for 720p HD video capture. T-Mobile is also boosting its group and cloud text messaging services, which now essentially let you text multiple contacts across different platforms. So, for example, if one buddy is working from his PC while another is on a tablet, you’ll be able to text both friends from your phone. For better or worse, T-Mobile is essentially taking apps like Pinger and Google Voice’s texting capabilities and replacing them with its own, carrier-branded versions. We don’t yet know the Doubletake’s price or release date, but it’ll be available in time for the holidays.